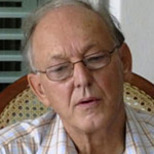 Michel Chossudovsky is an award-winning author, professor of economics (emeritus) at the University of Ottawa, founder and director of the Centre for Research on Globalization (CRG), Montreal and editor of the globalresearch.ca website. He is the author of The Globalization of Poverty and The New World Order (2003) and America’s “War on Terrorism” (2005). His most recent book is entitled Towards a World War III Scenario: The Dangers of Nuclear War (2011). He is also a contributor to the Encyclopaedia Britannica. His writings have been published in more than 20 languages. While the Western media portrays North Korea's nuclear weapons program as a threat to Global Security, it fails to acknowledge that the US has being threatening North Korea with a nuclear attack for more than half a century. On July 27, 2013, Armistice Day, Koreans in the North and the South will be commemorating the end of the Korean war (1950-53). Unknown to the broader public, the US had envisaged the use of nuclear weapons against North Korea at the very outset of the Korean War in 1950. In the immediate wake of the war, the US deployed nuclear weapons in South Korea for use on a pre-emptive basis against the Democratic People's Republic of Korea (DPRK) in violation of the July 1953 Armistice Agreement. The strategic objective of a nuclear attack under the "Hiroshima doctrine" was to trigger a "massive casualty producing event" resulting in tens of thousands of deaths. The objective was to terrorize an entire nation, as a means of military conquest. Military targets were not the main objective: the notion of "collateral damage" was used as a justification for the mass killing of civilians, under the official pretence that Hiroshima was "a military base" and that civilians were not the target. Nobody within the upper echelons of the US government and military believed that Hiroshima was a military base, Truman was lying to himself and to the American public. To this day the use of nuclear weapons against Japan is justified as a necessary cost for bringing the war to an end and ultimately "saving lives". The ROK's nuclear initiative was from the outset in the early 1970s under the supervision of the US and was developed as a component part of the US deployment of nuclear weapons, with a view to threatening North Korea. This withdrawal from Korea did not in any way modify the US threat of nuclear war directed against the DPRK. On the contrary: it was tied to changes in US military strategy with regard to the deployment of nuclear warheads. Major North Korean cities were to be targeted with nuclear warheads from US continental locations and from US strategic submarines (SSBN) rather than military facilities in South Korea. In addition to non-strategic air delivered bombs, sea-launched ballistic missiles onboard strategic Ohio-class submarines (SSBNs) patrolling in the Pacific appear also to have a mission against North Korea. A DOD General Inspector report from 1998 listed the Trident system as a "mission critical system" identified by U.S. Pacific Command and U.S. Forces Korea as "being of particular importance to them." Although the primary mission of the Trident system is directed against targets in Russia and China, a D5 missile launched in a low-trajectory flight provides a unique very short notice (12-13 minutes) strike capability against time-critical targets in North Korea. 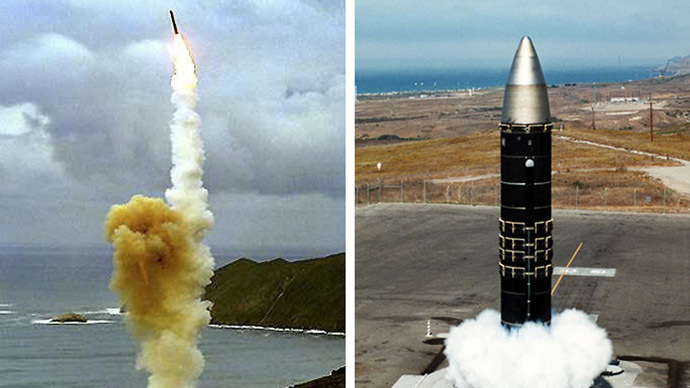 No other U.S. nuclear weapon system can get a warhead on target that fast. Two-three SSBNs are on "hard alert" in the Pacific at any given time, holding Russian, Chinese and North Korean targets at risk from designated patrol areas. "Requirements for U.S. nuclear strike capabilities" directed against North Korea were established as part of a Global Strike mission under the helm of US Strategic Command Headquarters in Omaha Nebraska, the so-called CONPLAN 8022, which was directed against a number of "rogue states" including North Korea as well as China and Russia:. "possesses 5,113 nuclear warheads, including tactical, strategic, and non-deployed weapons." "the US deploys 1,654 strategic nuclear warheads on 792 deployed ICBMs, SLBMs, and strategic bombers..."ArmsControl.org (April 2013). "has separated enough plutonium for roughly 4-8 nuclear warheads. North Korea unveiled a centrifuge facility in 2010, buts ability to produce highly-enriched uranium for weapons remains unclear." The Democratic People's Republic of Korea, the unspoken victim of US military aggression, has been incessantly portrayed as a war mongering nation, a menace to the American Homeland and a “threat to World peace”. These stylized accusations have become part of a media consensus. Meanwhile, Washington is now implementing a $32 billion refurbishing of strategic nuclear weapons as well as a revamping of its tactical nuclear weapons, which according to a 2002 Senate decision "are harmless to the surrounding civilian population."